Billed as ‘A gripping, pacy probe into the impact of domestic abuse’, Forever Changes actually offers much more than just a graphic portrayal of violence in the home. Over the course of an hour, it packs in a very varied and interesting insight into the causes and effects of an often hidden social issue, using music, imaginative staging and powerful performances. Dave Jones’ play looks at the issue from various aspects, with both the victim and perpetrator being allowed to separately give their side of the story alongside the investigating police and the victim’s mother whilst dramatizing the central relationship through set piece mini-scenes. What sets Forever Changes apart from most plays of this genre is the way live music, often blended with dialogue, enhances the changing mood throughout the performance creating real tensions and alleviating the need to show the actual violence. This is a play where the perspective continually changes almost seamlessly and avoids descending into a gory kitchen-sink drama. The minimalist set creatively changes from a police incident room to a domestic house very effectively and the audience is never in any doubt as to which characters are being represented. 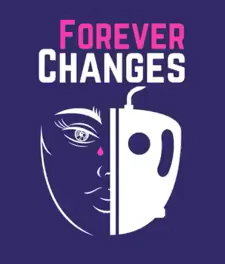 Forever changes is a two-hander in which the actors perform various roles including the couple in a violent marriage and two police officers working together in the domestic abuse unit. In each case, the chemistry is believable and works well. Craig Sanders presents a fine contract between the conscientious, slightly jaded policeman and the charming husband concealing a dangerous, manipulative streak. Mary Gerardine Hooton evokes real empathy as the devoted wife whose life descends in front of us into an increasingly dark and controlled hell. There is clearly something of an age gap in the married couple which whilst not unconvincing, suggests this might have had at least some impact on how the wife becomes so dominated. This is a minor issue because the husband’s chilling explanation to the audience of how he learned to charm and then manipulate amply demonstrates how abusive situations can happen. The age difference works well between the police officers, with the older officer reflecting back on his career. Credit must be paid to Deane Smith who composed and performed the innovative contemporary music. A student from the RNCM, Deane created some very atmospheric sounds essentially with just a Telecaster, a keyboard and the music was very much an integral part of the show without being distracting from the seriousness of the subject matter. Craig Sanders’ direction ensured a tight production which seemed to have the feel of a full-length play even though it only runs for an hour. An award winning director, an established cast and a talented composer was a strong recipe to bring Dave Jones’ play to life and the piece was named one of the top shows to see in 2017 by I Love Manchester. It is worth mentioning that this play was developed in partnership with Manchester Women’s Aid, ensuring that the presentation of the issues involved is a fair and accurate depiction. With this in mind, the story is the more shocking, knowing that it is fully authenticated. Manchester Festival Fringe keeps growing year on year and the 53two, a relatively new venue under the railway arches across the road from Bridgewater Hall is an excellent addition to the list of venues. Overall, this a well-acted, well-written drama which leaves you pondering both the performance and the subject well after visiting the theatre. Forever Changes premiered at 53two Theatre, 8 Albion Street, Manchester as part of the GMFringe Festival 17th and runs until 22nd July 2017. Tickets are available through the GMFringe Box Office.